Contest: WIN: Bracelet Stack worth $185! 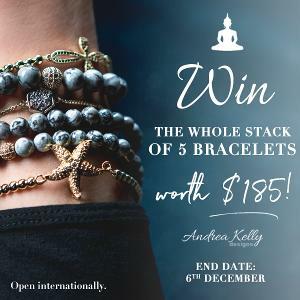 WIN: Bracelet Stack worth $185! Prize: 5 gemstone bracelets from Andrea Kelly Designs! Statistics: This contest was opened by 145 and entered by 21 ContestChest.com members. 14% of those who opened the contest, entered it.